The fungal pathogen Guignardia aesculi is responsible for Guignardia leaf blotch. 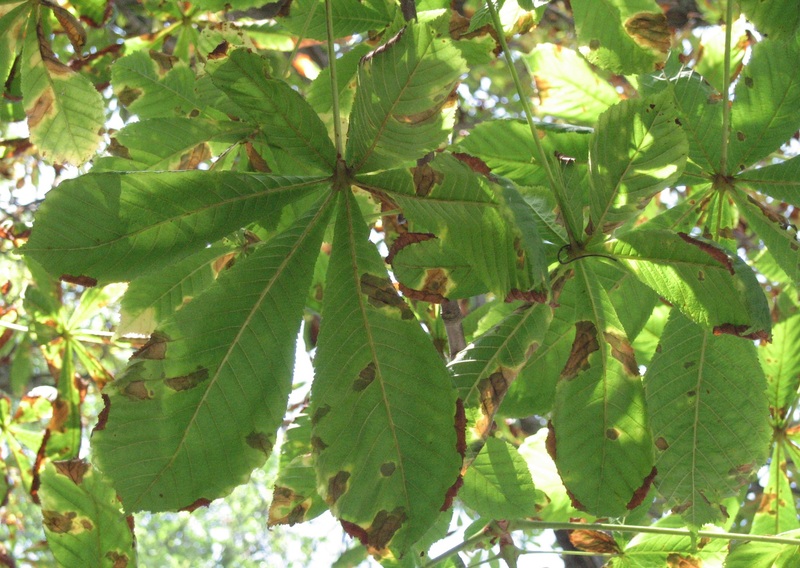 Guignardia leaf blotch infects many different Aesculus species throughout North America, Europe and Asia. In southern New England, horsechestnut (A. hippocastanum) is the most common host. While non-native, horsechestnut has been widely planted in urban and suburban landscapes. 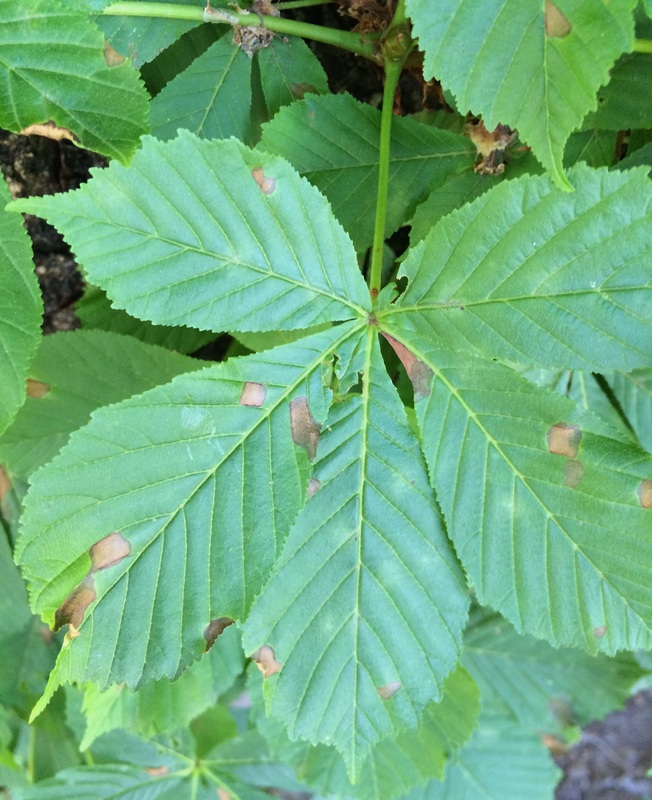 Less common ornamental species of Aesculus in New England are also susceptible, and include: bottlebrush (A. parviflora), Ohio (A. glabra), painted (A. sylvatica) and red (A. pavia) buckeye. Guignardia aesculi produces irregularly-shaped spots and blotches on the foliage of horsechestnuts growing in almost any setting. The disease is so common on this host that its occurrence is essentially guaranteed annually. When trees are flowering in spring, the disease is just beginning to establish for the season. However, soon after bloom, water-soaked, pale green lesions begin to form across the leaf surface. As the lesions expand, they become dry and turn orange-brown. When abundant on the margins, the foliage can curl and wrinkle, becoming generally distorted for the remainder of the growing season. In contrast to foliar blights, blotches attain a certain size and stop developing. Thus, the foliage is retained for the duration of the growing season. 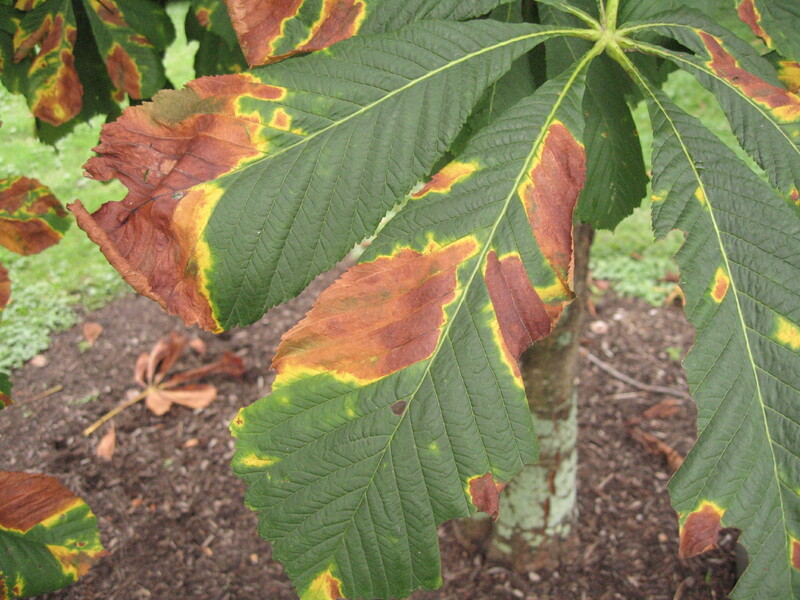 When wet weather is abundant in late spring and early summer, disease severity intensifies. During these years, the foliage appears scorched or burned late in the summer. Aside from growth losses due to unrealized photosynthetic capacity, the disease seems to have little effect on otherwise healthy trees. Upon close inspection, black-colored dots may be observed within the blotches. These represent the spore-bearing structures of the fungus. The fruiting bodies of Guignardia overwinter within infected leaves and release spores into the air in the spring to initiate new infections. During wet weather, the spores germinate and infect the leaves of susceptible trees. When conditions are wet during the summer, spores are readily dispersed, causing repeated infections of leaves, petioles and fruit. Discard fallen leaves to reduce the overwintering inoculum that initiates new infections the following spring. Prune interior canopy branches to increase air circulation and sunlight penetration, thus minimizing the periods of leaf wetness. 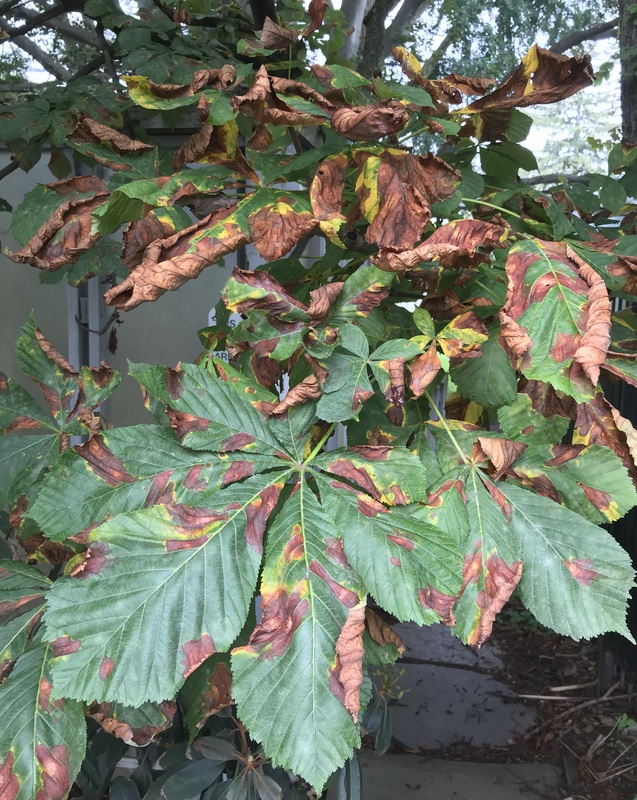 Severe blotching does not develop until after the majority of annual growth has occurred for the season, so Guignardia leaf blotch causes little harm to the health of vigorous trees. Fungicides serve to maintain the appearance of specimen trees and nursery stock, but in most cases are not warranted. Applications should take place as buds open to protect leaves from extensive primary infections. If adequate prevention of the primary infection is achieved in early spring, then repeated additional treatments are usually not necessary to control the secondary infection cycles, unless there are extended periods of cool and wet weather in early summer.